Yankees first baseman Luke Voit is big and beefy and slugs dingers—including one in the first inning on Opening Day—so one could probably assume that he consumes calories, at least on occasion, in order to give his body energy. 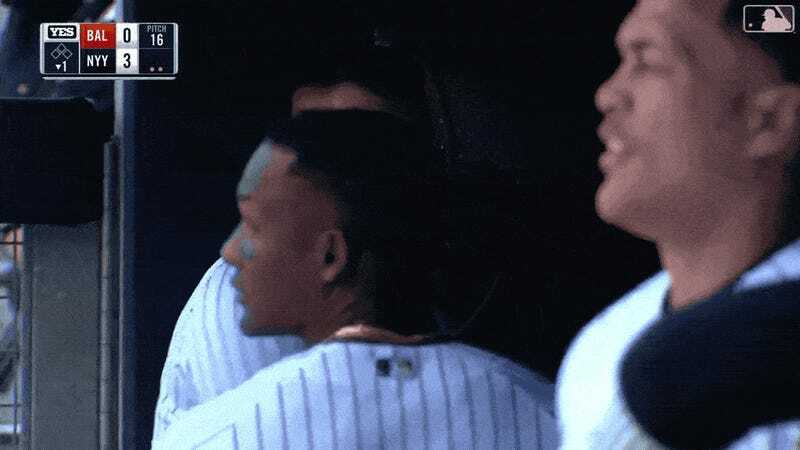 However, watch this brief clip of Voit sticking sunflower seeds around his mouth, and try to tell me that this man has ever eaten anything in his life. Does Voit get a single seed to stay that wide open mouth of his? I don’t think so, and even those stragglers on his lips get wiped off without a second thought, as if they were never meant to be there in the first place. On initial inspection, Voit appears to completely lack the ability or desire to taste, chew, swallow, or even spit. The results of a deeper investigation into Luke Voit’s ability to eat food were inconclusive, because believe it or not, there isn’t a whole lot of video of a guy who’s played barely 100 Major League games having dinner. There is one clip, however, that arouses my suspicions further. It’s from a Yankees “Day in the Life” video in which Voit allegedly consumes a cookie. “Gimme a cookie, I need a cookie,” Voit announces to his old teacher, unconvincingly. That settles it: Luke Voit must either film himself scarfing down a cheeseburger in one take, or return to his home planet immediately. Which Online Edgelord Mishaps Will Derail Trevor Bauer&apos;s Season?